Hello again Vetality fans, and welcome back to our four-part series on the most popular service dog breeds. Last time we discussed the Labrador Retriever, so this time we’ll profile the lovely and versatile Golden Retriever. Next time, we’ll feature the German Shepherd, and we’ll end our series with the Standard Poodle. Golden Retrievers are one of the most popular dog breeds in the world. 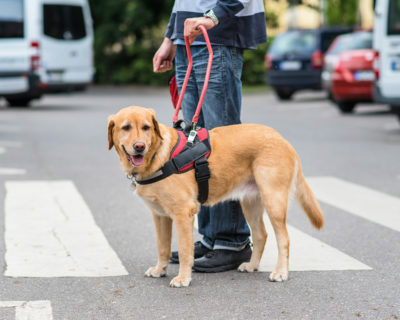 Some of the qualities that make them such great pets also help them excel as service dogs. Numerous Golden Retriever characteristics make them excellent service dogs. They have the size and strength to provide a person with physical support and the ability to pick up heavier objects—a function they have been specifically bred for. They are active without being too energetic and loyal without being too protective for public access work. Goldens are generally quite intelligent and easy to train for a variety of tasks. Aside from service work, they do well as hunting dogs, in obedience trials, and dock diving. Also, Golden Retrievers are particularly well known for getting along with children and other animals. The Golden Retriever was bred in Great Britain to be a birddog, particularly for hunting water fowl. This fantastic breed resulted from crossing a number of pre-existing breeds including various Spaniels, Setters, the Newfoundland, and perhaps even a Bloodhound or two. The combination created a strong-swimming dog that could withstand cold water, track wounded game, and retrieve crippled birds. Fully grown Golden Retrievers are broad, sturdy, and strong. They typically weigh between 60 and 70 pounds and stand between 22 and 24 inches at the withers. Their coats are wavier than those of their cousin the Labrador and range from cream to a dark golden brown. Their fur is also water-repellent, which is useful for almost any assistance dog. Because Goldens have long wavy fur, they do require regular grooming to prevent matts and ear infections. Goldens are devoted, intelligent, highly trainable dogs. In fact, the first 3 dogs to win the AKC’s obedience championship were Golden Retrievers! They take a joyous, exuberant approach to life, and get along with everyone they come across. They are physically active and enthusiastic, but not overly hyper. Affection and friendliness are given freely and appreciated in return. As already mentioned, Goldens get along well with children and most pets, often bonding strongly with the entire household. Providing both physical and mental stimulation are important for Goldens. Fortunately, service dog work tends to include both of these by default. While grooming isn’t terribly difficult, Goldens are prone to matts around their ears and to getting debris caught between their pads, so regular brushing and body checks are essential for this breed. As with any large dog breed, hip and elbow dysplasia should be screened for when selecting a Golden for service dog work. They are also prone to arthritis later in life. Other health problems common to Golden Retrievers are congenital heart disease, cataracts, and allergies. Typically, Golden Retrievers have an average life span of 10 to 12 years. Golden Retrievers rank in the top 3 most popular service dog breeds for lots of good reasons! They are affectionate, loyal, non-threatening in appearance, and easy to train. They do tend to be a little more sensitive compared to the average Labrador and take things more personally when they make a mistake. Patience and high-value rewards can help them overcome these drawbacks. If you do decide a Golden is a good choice for your lifestyle, be prepared for the whole world to adore your dog. Goldens are people magnets in a big way! If you don’t mind their constant fan club, you’ll never find a gentler, more loving, or more willing partner than the Golden Retriever!